Jennifer Egan's spellbinding interlocking narratives circle the lives of Bennie Salazar, an aging former punk rocker and record executive, and Sasha, the passionate, troubled young woman he employs. Although Bennie and Sasha never discover each other's pasts, the reader does, in intimate detail, along with the secret lives of a host of other characters whose paths intersect with theirs, over many years, in locales as varied as New York, San Francisco, Naples, and Africa.We first meet Sasha in her mid-thirties, on her therapist's couch in New York City, confronting her long-standing compulsion to steal. Later, we learn the genesis of her turmoil when we see her as the child of a violent marriage, then as a runaway living in Naples, then as a college student trying to avert the suicidal impulses of her best friend. 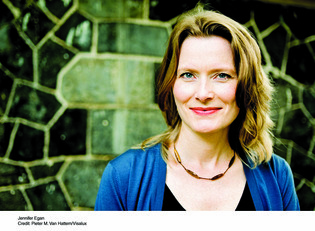 Jennifer Egan was born in Chicago, where her paternal grandfather was a police commander and bodyguard for President Truman during his visits to that city. She was raised in San Francisco and studied at the University of Pennsylvania and St. John's College, Cambridge, in England. In those student years she did a lot of traveling, often with a backpack: China, the former USSR, Japan, much of Europe, and those travels became the basis for her first novel, The Invisible Circus, and her story collection, Emerald City. She came to New York in 1987 and worked an array of wacky jobs while learning to write: catering at the World Trade Center; joining the word processing pool at a midtown law firm; serving as the private secretary for the Countess of Romanones, an OSS spy-turned-Spanish countess (by marriage) , who wrote a series of bestsellers about her spying experiences and famous friends. Egan has published short stories in many magazines, including The New Yorker, Harpers, Granta and McSweeney's. Her first novel, The Invisible Circus, came out in 1995 and was released as a movie starring Cameron Diaz in 2001. Her second novel, Look at Me, was a National Book Award Finalist in 2001, and her third, The Keep, was a national bestseller. Also a journalist, Egan has written many cover stories for the New York Times Magazine on topics ranging from young fashion models to the secret online lives of closeted gay teens. Her 2002 cover story on homeless children received the Carroll Kowal Journalism Award, and her 2008 story on bipolar children won an Outstanding Media Award from the National Alliance on Mental Illness. She lives in Brooklyn with her husband and two sons.